Whether you are looking to fix a damaged roof, upgrade the look of your home with new roof installation, or replace missing or broken shingles, the expert team of roofers at Roofsmith Restoration of Ohio can help. Our roofing services are available in and around the Greater Cleveland area. The good news is that all the problems explained below can be detected and corrected when you work with an experienced, full-service roofing contractor like Roofsmith Restoration. It’s smart to call in an experienced roofing professional if you find water leaking into your house from above. Roofsmith Restoration will inspect the chimney and vents for cracks in the flashing, check the eaves for damage from ice dams, look for damaged shingles, and check the attic for leaks in the deck. Let us help you choose the right replacement roof for your home. Roofsmith Restoration are your local experts for complete roof replacement. We service a wide variety of roofing materials and give you a durable, high quality roof that will perfectly complement your home and last for years to come. Call Roofsmith Restoration today if your roof is displaying these signs. 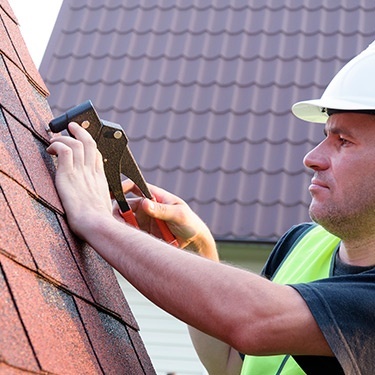 Our expert roof inspection can tell you if you need a full replacement or if repair and maintenance is a better option for your home. Besides having a leaky or damaged roof, there are other reasons why it might be smart to consider roof replacement. Increasing home value - Even if your asphalt shingle roof isn’t worn or damaged, it can make sense to replace your roofing to increase curb appeal and real estate value. Some homeowners decide to install new roofing as part of their preparation for selling a house. When combined with new exterior siding or an exterior paint job, new roofing can really make an older home look brand new. Apart from its aesthetic impact, a new roof offers a great deal of financial security to a prospective home buyer. The new owner won’t have to worry about roof replacement or common roofing problems for a long time. Replacing a worn roof - Asphalt roof shingles typically last anywhere from 15 to 25 years. Unfortunately, factors such as storm damage, low slope, ice damming, and mold or moss growth can significantly shorten the life of any asphalt roof. If your roof has any of the characteristics described in the “signs of worn roofing” sidebar, it’s a good idea to replace the roof. Otherwise, you risk even more severe problems like rotted roof framing and leaks that can damage the house and its contents. Completing a major remodel - Are you planning to build an addition? How about adding some dormers or skylights? These major remodeling projects involve changes to your roofline and the installation of new roofing. Rather than have an unattractive mix of new and old roofing, many homeowners elect to have a total re-roof done as part of the project. Roof repair and roof maintenance go hand in hand, as good maintenance will limit the scope of repair jobs. Roofsmith Restoration provides fast, effective repairs for wind, hail and other storm damage. At Roofsmith Restoration, our roofers are always ready to go at a moment's notice with the equipment and expertise needed to quickly and effectively repair all types of roof leaks and roofing damage. As one of Greater Cleveland's leading roofing companies, our roofing crews are well versed in all types of roofing materials and can solve any problem you may have. We specialize in roofing services to prevent and repair roof leaks. A professional roofer knows the tricks that water can play, so don’t risk climbing onto your roof and searching for the source yourself. Roofsmith Restoration provides fast, reliable leak detection and roof leak repair services for Ohio residents. We install soffit, gable & ridge vents for effective attic ventilation. The specialists at Roofsmith Restoration can help you choose the right type of roof vents for your home to help you gain a properly-balanced attic ventilation system. We stop wood rot from damaging your roof & devaluing your home. Most of the strategies for fighting dry rot throughout the house begin with your roof. If your roof is not sound and your gutters are clogged or misaligned, tremendous amounts of water can enter your home and saturate the ground around your foundation (which can also allow water to seep into your home). So, the first rule of home care is to make sure your roof is leak-free and in good repair. As a leading roofing contractor in Greater Cleveland, we offer comprehensive roofing services, including a variety of roof repairs to help you maintain your roof's condition. Roofsmith Restoration also understands that the roof is more than a barrier to rain and snow. It is also where your home exhales! A properly vented roof also expels much of the water vapor that builds up in the home and plays an important role in keeping the moisture content in building materials to safe levels. Following a severe storm, your first roofing concern is whether or not the storm caused any leakage that might damage your home’s interior. Even if your roof does survive a hail storm without leaking, there may still be significant hail damage. That’s why it’s important to call in an experienced roofing expert like Roofsmith Restoration to check your roof for hail damage. Keep your home comfortable year round with the right attic insulation. Fiberglass batts are the traditional form of insulation, fitting inside the joist cavities. Fiberglass insulation is an economical option, but can be prone to decay from moisture and pests. Blown-in insulation provides excellent R-value and will provide a long lasting solution. However, this may not be the ideal option for you if you use your attic for storage. Blown cellulose insulation provides the best R-value and fire resistance of the insulation options, though it will be a little more expensive. Having proper attic insulation can make a big difference for your home's comfort and energy costs. Roofsmith Restoration provides all the home insulation solutions you need, ensuring that your heating and cooling systems operate efficiently and you save money.